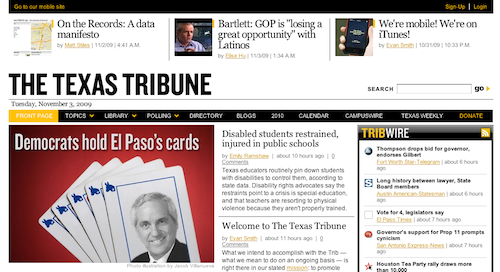 Nieman has a really nice post up about the new Texas Tribune site. They tour the features which look like a great combination of news you need now and informational utitliy areas. Perhaps Newspapers Are Dying Because Our Sense Of Place Is Too. We no longer imagine the newspaper as a city or the city as a newspaper. Whatever I may say in the rant that follows, I do not believe the decline of newspapers has been the result solely of computer technology or of the Internet. The forces working against newspapers are probably as varied and foregone as the Model-T Ford and the birth-control pill. We like to say that the invention of the internal-combustion engine changed us, changed the way we live. In truth, we built the Model-T Ford because we had changed; we wanted to remake the world to accommodate our restlessness. We might now say: Newspapers will be lost because technology will force us to acquire information in new ways. In that case, who will tell us what it means to live as citizens of Seattle or Denver or Ann Arbor? The truth is we no longer want to live in Seattle or Denver or Ann Arbor. Our inclination has led us to invent a digital cosmopolitanism that begins and ends with “I.” Careening down Geary Boulevard on the 38 bus, I can talk to my my dear Auntie in Delhi or I can view snapshots of my cousin’s wedding in Recife or I can listen to girl punk from Glasgow. The cost of my cyber-urban experience is disconnection from body, from presence, from city. From - Final edition: Twilight of the American newspaper—By Richard Rodriguez (Harper's Magazine) which reads like a Walter Benamin-like meditation on place and printed news. Unfortunately for linking purposes Harper's is behind a subscriber wall. Patch.com President Warren Webster told us in a separate discussion that the Patch team has learned a lot about local communities and what people are interested in. “Police and fire information is very popular,” and “government news inspires a lot of debate,” he said. Webster was surprised, however, that weddings and obituaries aren’t more popular at this point — perhaps because users aren’t yet conditioned to get that information from a local online site. School sports have been more promising. Here’s the rub: most peo­ple think­ing about ebooks are focused on cre­at­ing an elec­tronic recre­ation of print books, com­plete with down­load­able files and devices that look and feel like books. This is a bit like point­ing a cam­era at a stage play and con­clud­ing that was the essence of filmmaking! At O’Reilly, we’ve tried to focus not on the form of the book but on the job that it does for our cus­tomers. It teaches, it informs, it enter­tains. How might elec­tronic pub­lish­ing help us to advance those aims? How might we cre­ate a more effec­tive tool that would help our cus­tomers get their job done? It was by ask­ing our­selves those ques­tions that we real­ized the advan­tages of an online library avail­able by sub­scrip­tion. One of the best things about online tech­ni­cal books is the abil­ity to search the full text of a book. How much bet­ter would it be to be able to search across thou­sands of books? Safari Books Online was our answer. Jay: "The web is detaching itself from web 'site' and it's becoming 'stream.'" Dave: "If that's true, how do we get this thing to open up? It's not good enough for me to be dumping stuff into Twitter space and then complaining later than they don't own it. Because they do own it." Jay: Maybe it will take an user revolt like what happened at Digg in 2007. Dave: Why didn't the Suggested Users List trigger something like that? "The way Twitter is organized, it tends to dissipate those things." Jeff: "Things die out so quickly.... The half life of an idea on Twitter is about six minutes... That's what we have to solve here." Dave: If Twitter was an open web-based system we could fix these things. Jeff: "The blogosphere has the permanence that Twitter doesn't have. It's the old page web, the SEO web.... Use Twitter to feed something, if Twitter is the end in itself, we're screwed. We're putting things into this dispersed cloud that disappears." Drumroll... Fast on the heels of their redesign comes the state of the blogosphere this time with articles. Publishers with a Purpose is a group of online publishers who have pledged 5% of their total ad inventory to selected nonprofits and social causes, with the shared goal of making a difference in our neighborhoods and around the world by grouping together. Started by Flavorpill in October of 2009, PWP is a collaborative effort of world-class, independent publishers and important local and global causes which regularly update this site with ad creative around their latest projects. Our goal is to raise awareness and money for these worthy organizations. With this 5%, our founding publishers already represent more than 40,000,000 monthly impressions — a clear example that together, we can make a difference. A really nice idea. Not-For-Profits can add creative to the site. Publishers can pick it up and run it. links for 2009-08-07 - what do you think of the word 'masher"? Kind of amazing to name a kid's oriented virtual world media company Masher Media considering the meaning of masher. Can't wait for my daughter to get accosted by some virtual 8 year old boy hanging out on a corner. I've just launched a site for David Wessel and his book In Fed We Trust. Very simple and straightforward it leverages Typepad and it's journal black design with some modifications and template customization. It enables Wessel to update it himself, post news and video of appearances, add to the reviews. There is also a section where people can share thoughts, and see his most recent posts on Twitter. The book comes out officially on August 4th and the reviews are amazing. We did an interesting exercise in my last days at iVillage where we broke down the time a new mother actually had, in a long overdue who is our customer moment. A new parent is a tough customer - as they are about to become a parent they have time and are looking for advice, when the baby is born time disappears, and when the kid(s) are older it reappears.So if you are going after the early years you better provide value and fill a need. So all of these sites are competing for very little time. Do these sites help parents get the support they need? Do they really enhance the ability to share with relatives? Do they save time? Don't get me wrong these sites wee-web, baveo, and Lilgrams are all really good but they also feel almost like social media apps that were built on spec to be sold or partnered with the bigger players who get the audiences looking for advice. I really like lilgrams, it has a beautiful UI. It builds a digital baby-book over time. I like that framework. It can be white-labeled and used for other things too. Wee-web is great in concept, so easy, and obvious. It offers a kind of closed facebook experience photos and updates that people can comment on (purposeful and controlled web social media apps are it and this is a great example). The fact that it uses api's to pull in info from other places I've put it makes it more likely that I would use it. Bit I was so impressed by it at the tech meetup that I told a friend with a newborn to try it. Baveo is more like a tumblr blog with links to registries. For me they are nice but not must have's, nor are they for my wife so I don't actually think the launch of so many of these projects right now means that the "market is right, that there is a need". I think they may be the result of a bunch of new techy fathers trying to make a version of babylegs. It is going to come down to marketing and partnerships with the bigger players, smart recs from parenting communities, and real value for them to break out but I don't see them becoming huge standalones. I could easily be wrong but I see them all ultimately trying to exit to bigger sites. Perhaps I am already too entrenched with flickr and set in my ways. What I need is advice, recommendations, a friend with a kid W's age to go on a walk with, time, and people to contribute to W's Freshman fund account - now that is a service to love! I like savvyauntie a lot too as it addresses a need for people in a baby's life who is not a parent. Thoughts? I just read about and then created an offbeat guide to Boston for a trip I'm going to take this weekend. The steps to create it are simple, the ui is great, and I've always been a fan of .pdfs and web to print products. (I'm eagerly awaiting my new MOO cards) Did I pull the trigger and purchase it, well no, but I did spend a lot of time reading up on Boston neighborhoods, and I could see buying one in the future. In the meantime ads and links for leads could be baked in for utility. I could see reserving a restaurant, etc.They seem to have covered an enormous number of places already. The idea is great, in many ways a breakthrough but in other ways an older idea whose time is right. A few years ago I was a big fan of a company called Booktailor which was a Bertlesmann funded startup which unfortunately shut during the downturn in 2001. They licensed editorial from publishers and then printed a Filofax like custom guide for you to take on your trip. A lot of time has passed and made this more viable, OffbeatGuides can gather wikipedia, localeze, and eventful info, they can license content and add more and more interesting things. Things have changed - web to print has advanced (we are in a new era of web to print - MOO, JPG, and many others doing beautiful stuff - not publishers oddly but others) APIs didn't really exist, a .pdf isn't something to explain or provide a link to Adobe for, and the e-commerce is a no-brainer. So the timing is right. I'd like to see them add great local blogs, or do something to pull in local news as an optional chapter. One of the things I loved about booktailor was the related literature which they might be able to do with google book search. I like the fact that Offbeat Guides lets you make custom chapters and paste in info so that is one way to accomodate this. And of course I love tours so pulling that in would be good too. As for biz dev they could power the awful AAA TripTik program, come with car rentals, hotel reservations etc. and the partnerships ops with places like trip advisor are ample. There are really smart people behind this so it will be exciting to see where it goes. I've always loved this idea and it is great to see it live again. No mention of iVillage in the NYT Mag article about Lauren Zalaznick. Unless I missed it iVillage wasn't mentioned once in the article. There was however an iVillage Tax Credit Analysis powerpoint on her very clean desk in the portrait. You can sort of see it in the online version of the photo. I was invited to a screening of the new U2 in 3D movie two night ago. It was great. Taped at stadium concerts in Brazil and Argentina. At times Bono can be a little preachy for my taste and I get freaked out by 100,000s of thousands of people chanting and putting their arms in the air but he is a ROCK STAR and their songs are great. It is amazing what a 4 person band can do. The 3d effects are not overused and bring the crowd and music to life. It is one of the first 3d movies to have zoom and some other shots or so we were told. I thought the 3d was used to great effect when you feel as if you are one of the crowd and, there are only a few instances of Bono and guitars hovering out in front of your face. Also one incident of 3d cartoon style drawing but even that was cool. The credits are all in 3d and seem to go on forever before a little more concert appears. All in all very cool and different from any 3d movie I've seen before so I've put the promo widget into this post. Should/Can a media company launch a social network by not launching a social network and just leverage facebook and all of the other social nets that are about to open? Learned in a meeting today that Dogbook, a facebook app is larger than Dogster right now after only three or four months. The app gives you a sub-profile that could serve ads and you could probably replicate this over and over so why bother launching a stand alone? Or perhaps do both? Paidcontent reports that Treehugger has been bought by Discovery for about 15 million dollars. Makes sense to complement their green TV programming. I've been a long-time (well as long as its been around) reader of treehugger and was impressed by the way they added new features. When they wanted to do video they posted to YouTube and then vlogged it before moving on to their own player. They also introduced a flavor of digg to cover environmental issues. I followed an article about real life housing prices to this article about Second Life's economy facing serious issues. Same issues as real life but hugely leveraged and now probably exacerbated by the fact that they are illiquid given that not as many virtual people are there as Wired kindly shares with us in an excellent article. About time! Will it blend is a series of videos in which various items, some safe to repeat at home, some not, are put in a blender made by BlendTec. This really smart infomercial stuff. It shows that the blender can shred most anything and who wouldn't want that in a blender. It establishes a rapport with an audience who requests the next blended object. And they've developed such a following that even the remains of the poor iPhone below is being sold on ebay and is up to the price of a whole one. Are the makers of the Ginsu knife following suit?